Cereal processing by-products contain several nutritional compounds such as proteins, arabinoxylans and β-glucan that could be recovered and used in several applications. For instance, the proteins of rice, corn, barley and wheat processing by-products have the appropriate functional properties to be used in food systems as it has been proposed by many researchers over the last decades. Nevertheless, their extraction is difficult since most of them are enclosed in aleurone cells and enveloped by polysaccharide clusters. Alkaline extraction coupled with isoelectric precipitation are the classic extraction method, but there are concerns about their detrimental effects on proteins’ nutritive value and functionality. Other biotechnological and physical strategies have been assayed to improve the extractability of proteins, but these methods are not used yet, probably because they conflict with technical, economic, environmental and legislative considerations, e.g. low yields and co-generation of other by-products, difficulties of introducing new additives into the food or feed markets etc. Membrane technologies offer great potential for the recovery of valuable compounds from cereal processing by-products due to their intrinsic properties and key advantages over conventional methodologies. In particular, process flow-sheets based on a combination of membrane systems in a sequential design have been proposed in order to valorize oat, wheat, rice and corn by-products. The specific feature of these hybrid processes is the synergy resulting from this integration, with overall important benefits in product quality, plant compactness, environmental impact and energetic aspects. 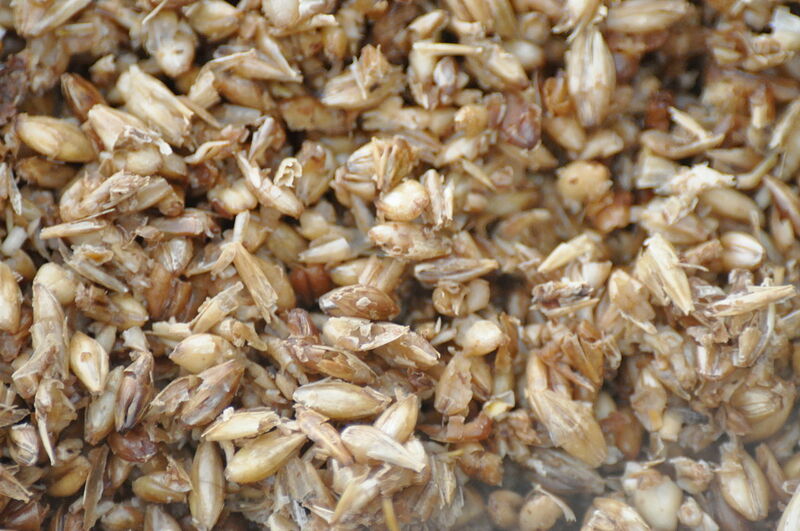 During the process of malting and brewing, the by-products left after separation of the wort are rich in protein, fibers, arabinoxylans β-glucan and polyphenols. For instance, BSG is the major by-product of the brewing industry, representing ~85% of the total by-products generated. In Europe, the annual production of BSG on dry matter basis was around 3.5 Mt in 2007. BSG is rich in cellulose (17%), non-cellulosic polysaccharides (28%) and lignin (28%), but it also contains considerable amounts of polyphenols. Currently, BSG is sold as cattle feed, but it could be upgraded into valuable products for the food market due to its food grade nature. Arabinoxylans are one of the most abundant non-starch polysaccharides of cereal grains cell walls. Depending on cereal by-products main tissues, arabinoxylans can present different structural complexity and properties (e.g. viscous and water retention coupled with high nutritional impact and health promoting effects). Hydrothermal, chemical and enzymatic treatments allow the recovery of different arabinoxylans, arabino-oligosaccharides and sugar monomers. Arabinoxylans can be applied as functional ingredients or soluble sources of fibre in bakery products, as well as fat replacers in dairy and meat products, whereas arabino-oligosaccharides have prebiotic properties (e.g. bifidogenic enhancement). In any case, the challenge is to match the arabinoxylans structural features with the required properties of the final products. Primary and secondary processing of cereals results in a wide range of waste material entrapping resources that comprise an excellent substrate for the production of vanillin and industrial enzymes such as amylases, proteases, cellulases and xylanase. Besides, they could be converted into useful products and utilized in enriched foods (e.g. cookies, snacks, seasonings and flavors), prebiotics, probiotics and health care products. The most popular application of cereal bran is their addition in baked products, e.g. to increase their fibre content. However, fortification of baked products with cereal processing by-products can affect negatively their sensory characteristics and quality of bread by providing bitterness, reducing bread’s volume and causing textural changes (porosity, elasticity). The bitter or astringent taste of wholegrain, bran and germ is due to the contained phenolic compounds (pinoresinol and syringic acid). In order to improve the quality of end-products and retard rancidity, different pre-treatments (e.g. milling, pre-soaking, hydrothermal treatments, extraction, extrusion, fermentation, enzymatic or chemical treatment) of cereal by-products have been successfully tested before usage. Sustainable Recovery and Reutilization of Cereal Processing By-Products addresses topics associated with the sustainable management of cereal manufacturing. Emphasis is placed on current, advisable practices, general valorization techniques of cereal processing by-products, and the functional properties of healthy cereal by-product components that lead to target applications in foods and nutraceuticals. General valorization techniques of cereal processing by-products include focus on wheat bran, distillers’ dried grains -based within the biorefinery concept, and different techniques for the separation, extraction, recovery and formulation of valuable compounds, including proteins, arabinoxylans, and beta-glucan. Over the last years, Food Waste Recovery Group has organized a series of workshops (e.g. the 2nd one comes on 2nd of July in Stuttgart), teaching activities (webinars, e-course etc) and books targeting food waste recovery processing and industrial techniques, describing tools for the implementation of innovations in the food industry, exploring the effect of emerging and non-thermal technologies on nutraceuticals and functional foods development, as well as highlighting the sustainable solutions for the management of specific food processing by-products from the olive, grape and coffee industry. Charis M. Galanakis is an interdisciplinary scientist with a fast-expanding work that balances between food and environment, industry, and academia. His research targets mainly the separation and recovery of functional macro- and micromolecules from different food by-products, as well as their implementation as additives in food and other products. He is the coordinator of Food Waste Recovery Group of ISEKI Food Association (Vienna, Austria) and R&I director of Galanakis Laboratories (Chania, Greece). He serves as an editorial board member and subject editor of Food and Bioproducts Processing and Food Research International, and he has edited 9 books with Elsevier.Follow Dr. Galanakis via Twitter – @CharisGalanakis, LinkedIn or ResearchGate.